Members of "Tag Meir" group and local Arabs arrive in Tekoa to pay condolence visit to Ansbacher family. "We are brothers." 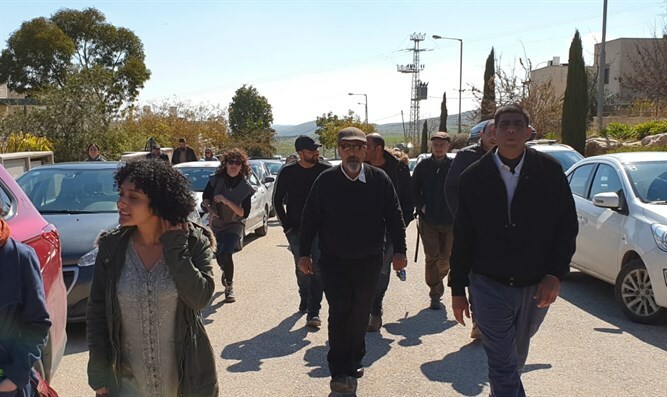 Members of the leftist group “Tag Meir” arrived this morning, Tuesday, to the community Tekoa south of Jerusalem, together with Arabs from the area, to pay a condolence visit to the Ansbacher family, whose daughter Ori was brutally murdered by an Arab terrorist on Thursday. A video shows Hadassah Froman, the wife of the late rabbi of Tekoa Menachem Froman, entreating the group outside the Ansbacher home not to bring up politics once they are inside. He said it was not the first time he has come to a settlement to console after a murder, though it was the first time that the media, which he emphasized he had not notified, knew about it. “We are brothers. I am always received nicely, and unfortunately there were cases like this in the past, and I hope this is the last case,” he said. Asked if cases like this cause him to doubt his "approach," he said, "Cases like this cause me to doubt the tilted policy of the government, which has brought us to cases like this."